Yachts Miami Beach, formerly known as the Yacht & Brokerage Show in Miami Beach, is set to take place Feb. 11-15 along Collins Avenue across from the Fontainebleau and Eden Roc hotels, a location it has called home for 28 years. 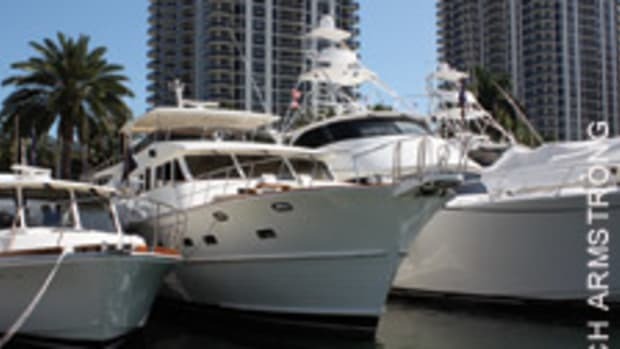 Two different boat shows take place in Miami and Miami Beach during the Presidents Day weekend in February. Touted as Miami Beach’s premier in-water luxury yacht show, Yachts Miami Beach attracts thousands of people from around the world to a display of yachts and marine products, including more than 500 new and brokerage yachts and a wide array of the latest marine technology and accessories valued at more than $1 billion. The show also offers floating cocktail lounges, food and live musical entertainment. 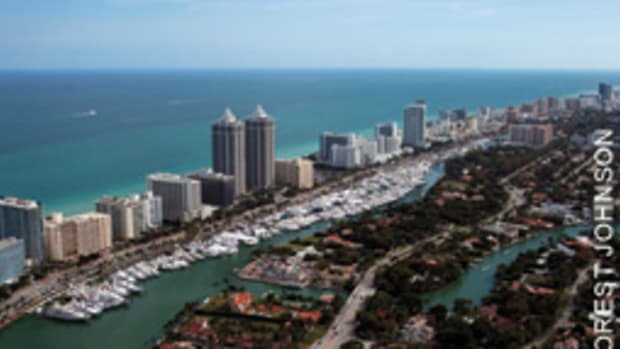 Covering more than 1.2 million square feet of space, Yachts Miami Beach spans more than a mile-long strip of the Indian Creek Waterway from 41st Street to 54th Street along Collins Avenue. An additional Yachts Miami Beach location at Island Gardens Deep Harbour Marina on Watson Island will feature a limited selection of superyachts from companies that include Burgess, Moran Yacht & Ship, Norwood and Ocean Independence. Once completed, the new marina will be able to accommodate 35 to 75 yachts from 80 to 550 feet, the largest collection of slips for yachts of this size in South Florida and North America’s only marina exclusively designed for superyachts. Transportation will be available from Yachts Miami Beach on Collins Avenue to Island Gardens Deep Harbour on Watson Island.